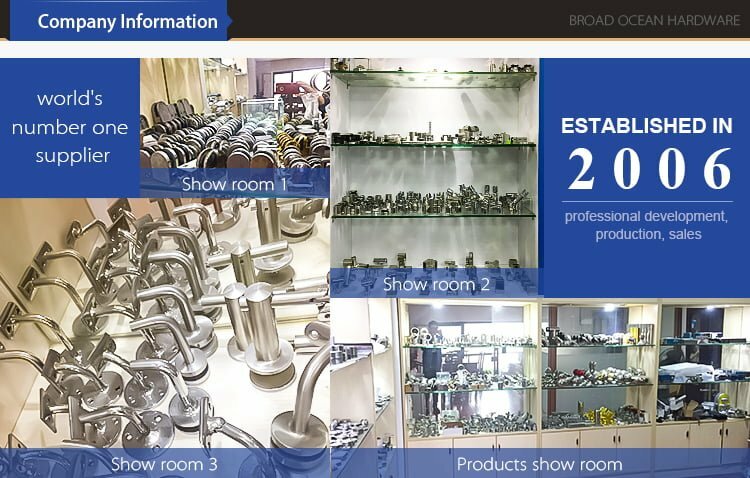 Foshan Broad Ocean Hardware Co.,Ltd. is a privately owned and export-oriented manufacturer. Our production range inlcude investment casting, fabrication, CNC machining and assembly, and our quality products are being exported to United states, Canada, Austrailia, Demark, Korea and many other countries since 2006. With many years experience in metal processing, quality control and customer service, we have set up our unique management system for all our products. Complete Quality Assurance system makes our products 100% reliable, so we have very good reputation in our customers, and have become one of the top performers in our market segment. Our main focus is on the manufacture of specialized products for demanding applications, we guarantee economical price, frienly service and superb quality to you. To succeed with us together ! 3. Service efficiency: After being notified by the supplier, the salesperson must respond to the customer within 12 hours. 1.With 10 years experience, exporting to all over the world especially Australia, Europe, American ,we are have good reputation in hardware industry. 2. Having own factory to make glass spider, glass spigots, hinges, handrail fittings, tension rods, etc, we also can produce as your requirement according to drawing. 3. Good production ability, we can supply about 90 tons stainless steel hardware in one month with excellent quality. 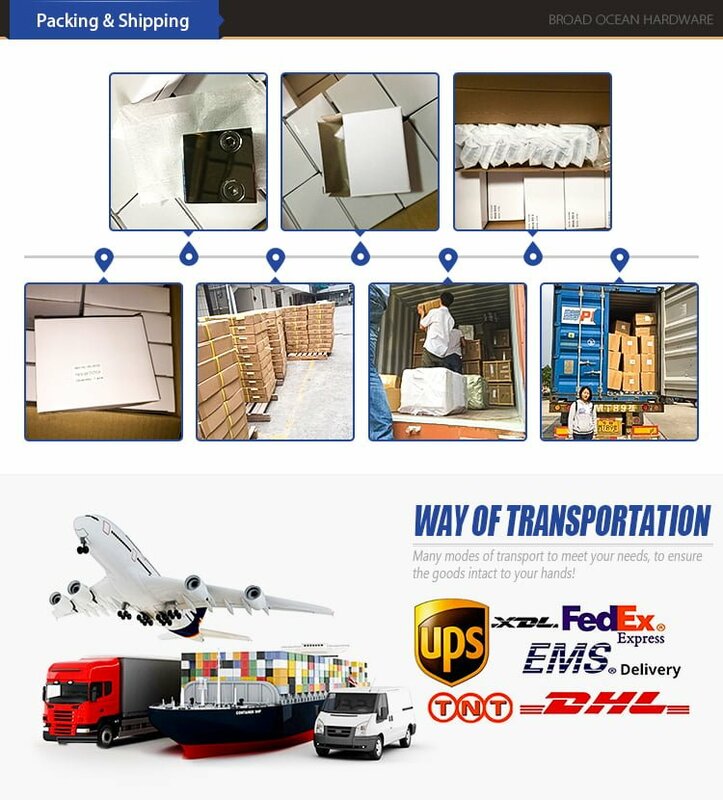 4.Fast delivery, generally speaking, our delivery time is 7~10 workdays. 5.Feedback in time, 24 hours with email or online communication service. 6.After sales service, prompt delivery services, provide maintenance specification services, warranty service. We have two factories. One is for handrail fittings in Foshan City,another is for ss pipes in Chaozhou City. Q2.What material do you have? Q3.Can you provide sample for us? we ensure the quality control by 2 steps: 1)after finish, our workers will check it one by one. 2)our package department will check before they pack. Q5. How do you ship the goods to us? Our freight forwarders have been working with us for 2 years and they can ship to you at competitive prices in a very short time. You can ship them through your own agent. Q6. Which country is your main market now? Middle East, North Africa, West Africa, Southeast Asia, South America and Northern Europe. Especially in Saudi Arabia, Morocco, Nigeria, India, Bangladesh and Russia have a solid customer base. Q7. Can you make a complete set of handrails for us? Yes, we can, our engineers will check your project drawings to ensure their accuracy for each different accessory and quantity. Q8. How is your delivery time? Pipeline for 15-20 days. Handrail fittings for 25-30 days. Q9. What is your payment terms? Get more than 20% off!